I am a big fan of all the Hakushus I’ve tried (not very many): the 12 yo, the Heavily Peated (not the one released in the US but the original at 48%) and the Bourbon Barrel. I’d always wanted to buy a bottle of the 18 yo as well but failed to do so before the prices of Japanese whisky went through the roof—it’s not available in the US and in the UK now runs about £160 which is way more than I am willing to pay for 18 yo whisky. And so I’m very glad to be able to try it now through a sample swap. I don’t really know anything about how this is made or composed—if you do, please write in below. 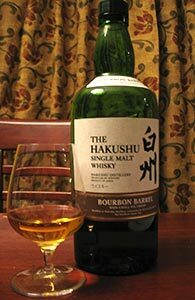 I have previously reviewed the Hakushu Bourbon Barrel and the Hakushu “Heavily Peated” (due to arrive in the US soon), and here finally is a review of the very popular Hakushu 12, which has been available in the US for a year or two (though not always easy to find)–I don’t know if it’s yet made it to Minnesota. I have plowed through a couple of bottles, and this review is from a large sample saved from my previous bottle. As with the Yamazaki 18, now that I have a replacement it is safe to plunder it. This is the Hakushu counterpart to the Yamazaki Bourbon Barrel (part of what seems to be Suntory’s annual special release lineup). This was purchased last year and is probably from the 2011 release. 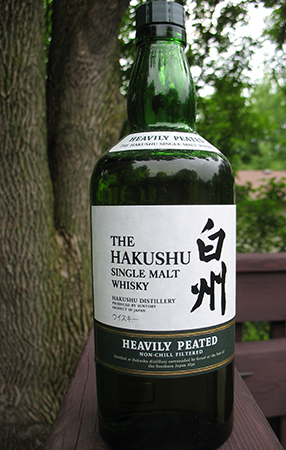 It is one of only three Hakushus I’ve ever had (my review of the Heavily Peated is here, and my review of the regular 12yo will come whenever I open my next bottle). The Hakushu 18, which is not available in the US, is strikingly more expensive than its younger siblings, and the 25yo is ludicrously more expensive than the 18yo. 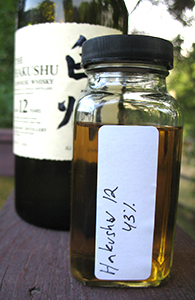 And as the recent Hakushu Sherry Cask release disappeared in a matter of minutes it doesn’t seem likely that I will add to my count of three Hakushus sampled anytime in the near future. So it goes. 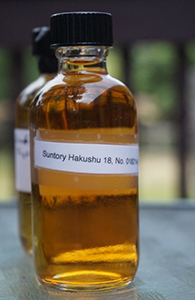 Hakushu is another distillery owned by Suntory, and as of a couple of years ago its regular 12 yo expression is available in the US. This particular expression, the Heavily Peated (a bit of a misnomer, as you will see below) is not, though I think I may have read rumours that it may be soon. If so, that’s very good news, for I like this one very much and it would be nice to not have to rely on the kindness of friends passing through Japan or elsewhere in the world where it is available to get the occasional bottle. I know very little about Hakushu and so will spare you a preamble that might give a different impression (you can find out a little about it on Nonjatta). I’ve only had three of their expressions–this one, the 12 yo and the Bourbon Barrel–and like them all very much. There are older versions (18 and 25 years old) available internationally but the prices are somewhat forbidding. Earlier this year (or maybe it was late last year) a sherry cask was released but it sold out in about three minutes (I am exaggerating but only very slightly). Oh well, perhaps one of these decades we’ll get the full range of Japanese whisky in the US.